After receiving some initial information about your proposed venture, we can set up a meeting that will help each of us understand the value proposition of your product and all the other related aspects that follow. Below is an info-graphic that shows how some of these issues will be covered during this overview session. When we first discuss the value proposition of your product idea, we will attempt to understand what is the minimal viable product you need to create and offer to your prospective customers. Included in this discussion with your CTO would be the reasons for creating the product, the product’s scope, budget and time constraints (if any). The next task is to define who your target audience is, this could be a well known demographic of a group who are commonly interested in similarly situated set of products or, because your product is something unique to them, it could be something completely unknown to the market. Either way there is a multi-stepped process to work out with your CTO in order to determine the complete scope of the audience you are targeting. It is also worth considering your product’s competition before you begin to develop your product. If the market is too saturated or on the other hand, too unfamiliar with the kind of product you are offering, you may want to discuss strategies with your part-time CTO and contemplate all the possible problems that could arise by the time you are ready to take your product to market for testing. When you are first deciding to develop a product, your Startup CTO will ask you what your product’s niche market exactly is. Not only do you have to decide upon a market demographic of who would be using and buying your product, you also have to make sure that your proposed product is situated in its own niche, a place that your product uniquely fulfills and one that hasn’t been already over-filled by other existing products. Once the above four questions have been answered, you and your prospective start-up CTO will work out all the other unique considerations pertaining to your specific product offering. Some of the most important questions are: How you are going to market your offering? Which marketing channels are you going to use? and What is the estimated budget needed for taking your minimal viable product to market? Sometimes dealing with these marketing considerations can change your product perspective,so understanding this before starting to develop your product is important. 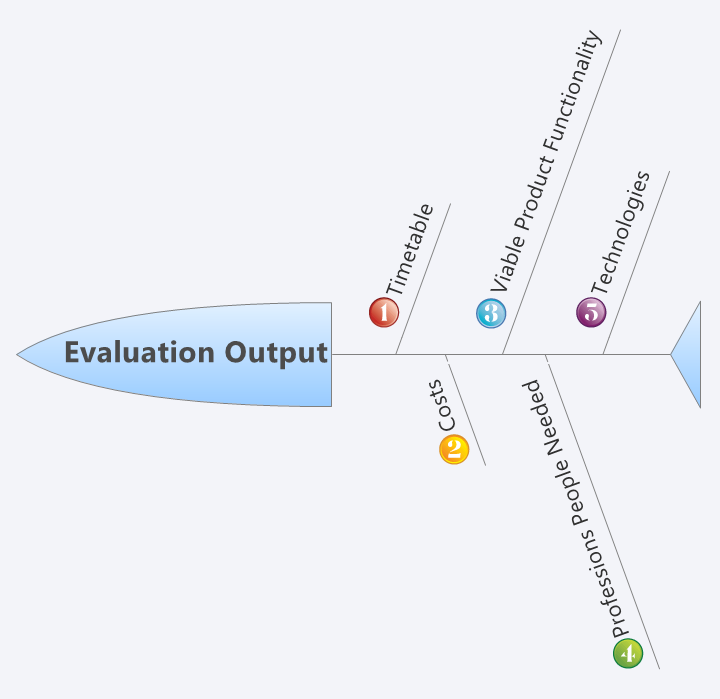 Indeed, there are many things to discuss with your CTO before your product’s Evaluation Output can be determined. The Evaluation Output of our first overview session would have as its goal the aim of gaining an initial understanding of everything that is needed to productize your idea and bring a minimal viable product to the market. The above diagram is generally explained in the following multi-stage process of analysis. The first thing needed to establish with your startup CTO are the many stages needed to productize your idea and bring it to market. This will help you better determine a workable and realistic timetable of each and every stage that your product’s development will go through. The conversation you have with your consulting CTO about your timeline is essential for understanding all of the steps needed in getting your product to the testing stage, and if any step is skipped or omitted, this could result in further unforeseen delays, and of course, extra development costs. Once you have outlined the steps and processes needed to productize your idea, you will be better situated to discuss with your part-time CTO the full scope of the costs that developing your minimal viable product will incur. Not only is it sometimes expensive to productize your idea, you may also be accountable to your venture capital investors who also have a stake in making sure this process happens smoothly. Once you have defined your minimal viable product, you will need to determine its functionality. Defining a viable product’s functionality is essential to understanding the scope of the development project, its timetable, and its costs. The functionality of the product also determines the type of technology needed and therefore the kinds of people you need to hire on your team. The next and final step in this initial conversation is determining the best and most cost effective technology to use to develop your idea into a product. Your start-up CTO is best able to make this decision once he understands all of the factors and future developments that you think your product will undergo beyond its initial minimal viable product offering. The initial Evaluation Process that has been outlined above will hopefully give you an the understanding of the first few conversations you will have with your consulting CTO on what it takes to grow your idea into a product. 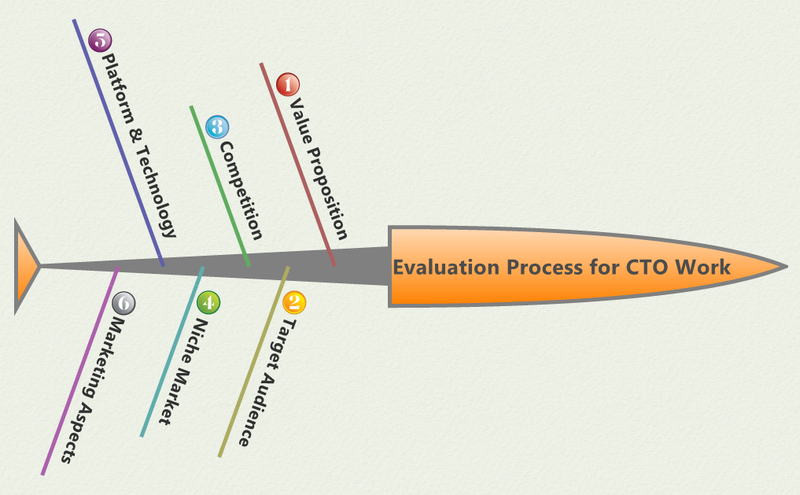 Overall, this analysis of the evaluation process shows how having a conversation with a JumpStartCTO can go a long way towards helping entrepreneurs achieve their goals, especially with the early stages of ventures. The Evaluation Process described above demonstrates the usefulness that a consulting part-time CTO provides, as he is the one in charge of streamlining the processes needed to develop an idea into a viable product that is ready to be introduced into the market.